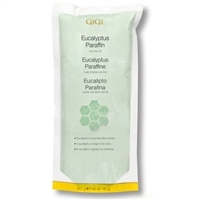 Gigi's Eucalyptus Paraffin Wax with tea tree oil, Apricot Kernel Oil, Lavender Oil and Menthol. Each unit is one pound. Do not heat in the plastic bag or in a microwave. Eucalyptus is soothing, comforting, and promotes a sense of well-being. For Professiona Use. Gigi Item #0895. All-purpose, epilating body wax.